This Lemon Martini uses Limoncello - like the Lemon Cream Pie Martini - but it's a meringue pie martini so there are egg whites* in it to give the martini that lovely fluffy meringue like texture. 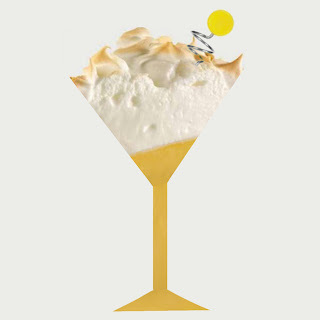 I swear this tastes just like a lemon meringue pie, right down to the perfect sweet-tart tanginess. If you miss the pie crust just bake one of those ready-mades up, crush it up with some sugar and rim the glass with that! If you don't like the frothiness that a blender gives just shake the ingredients up in a martini shaker for a smoother experience! I love chocolate and lemon together so sometimes I rim the glass in finely shaved dark chocolate. It tastes like my Choco-Lemon Pie.